There were 18 of us on the Dovedale trip staying at the excellent HF Peveril of the Peak Hotel at Thorpe. On Friday the main group set off through lush green fields to Tissington, the well manicured estate village complete with duck pond but no pub. We then took advantage of Mr. Beeching’s legacy walking down the old LNWR Buxton to Ashbourne line before descending to Thorpe with most carrying on to take in the famous stepping stones across the Dove before the climb back to our excellent HF accommodation complete with a bar with 2 real ales. The hotel was busy, most staying there were on HF holidays going on led walks so a real mix of people to dine with and chat to and the HF Leaders were friendly and helpful. 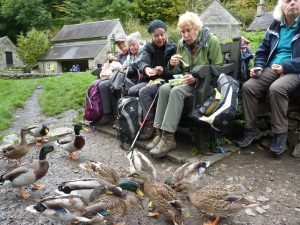 On Saturday the main group set off to catch a bus to Hartington, we had to walk in the rain over the fields to Fenny Bentley and were joined by another walking group at the bus stop but all squeezed on to the diminutive bus. It was still raining at Hartington so we bravely headed for the nearest teashop to consider our options. I am pleased to say we all opted for the 9 mile walk back to HF taking in the various dales created by glacial meltwaters and now occupied by the pretty river Dove. En-route we were pleased to see several dippers and a heron but our lunch stop at Milldale had the most wildlife as we fended off a massed flock of ravenous ducks who did receive some sustenance from us. 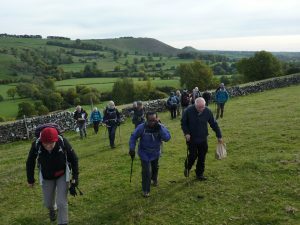 We carried on down the gorge with limestone caves and pinnacles and when we were close to base some of us climbed Thorpe Cloud for a great view of Dovedale and the lush farmland to the south. A smaller group did Friday’s walk which they had missed then and others visited the excellent Crich Tram Museum, Ashbourne and the 17th century Sudbury Hall. On Sunday the weather was a lot better, dry and fresh. We all drove to Ilam Hall then set off to the west climbing up the ridge separating the Hamps and Manifold valleys from which we could see as far as Axe Edge. We had to negotiate the stony descent down Soles Hollow then followed the Manifold Trail up the old Leek and Manifold Railway route to Beeston Tor. We split here with some climbing up through parkland to the remains of the Tudor Throwley Hall before the descent back to Ilam. The longer route took us further up the Manifold valley then the haul up to Wetton village before the descent to an excellent Ice Cream stop at Weag’s Bridge, then following the same route back. What was strange was the dry bed of the river we saw all the way back with the waters resurgence near the Hall. For our final walk we traversed fields and woodland to Mapleton with its unusual church before crossing Okeover Bridge and passing Okeover Hall to follow the Limestone Way back to Thorpe. After saying our farewells we all set off back home. As usual our thanks go to the walks leaders (Vyv, Sally, Alex, Hilary, Bob and John) whose guidance made the trip most enjoyable and a special thank you to Hilary for arranging everything else.